SEALWATCH.ORG - Harbor Seal Heads Up! At a time when an Mass Mortality Event has been claiming the lives of over 1000 harbor seals along the US Atlantic seaboard, the news has come that harbor seals in Iceland are at risk of extinction. Not because of disease or pollution, though both are likely contributing factors, but mostly due to a complete lack of legal protection. And a common practice of hunting in the name of fisheries management, according to Iceland Magazine. While populations in other parts of European waters tend to be robust, Icelandic numbers have plunged precipitously, with no more than 7600 animals remaining, as declared by the Icelandic Natural History Museum in its newest list of endangered species, released on October 17 of this year. 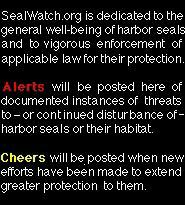 As SealWatch.org has described in previous Heads Up Alerts, similar management practices vigorously defended by fisheries interests in Western Canada and the United Kingdom potentially would produce the same result. These attitudes and behaviors persist, despite compelling scientific evidence from marine biology researchers that such "culling" serves no economic or environmental purpose!